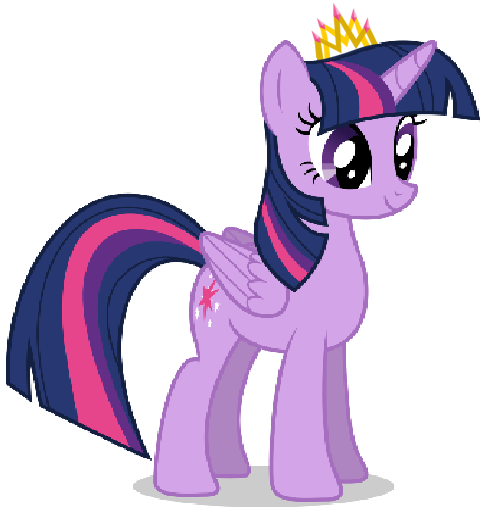 Short Introduction: Hello Everypony I am Twilight Sparkle. Please don't let the Crown, Horn, & Wings fool you I'm a normal pony just like anypony else here is Ponyville. I like to hang out with my friends, Read, go on adventers, or and sometimes with the help of my friends save Equestria from evil things. Yep I'm just your normal everyday Pony. Backstory: Twilight started life living in Canterlot with her mom Twilight Velvet, dad Night Light, & Big Brother Shining Armor. Her brother was her only friend & when her nose was not in a book they spent time together and played together. At a Young age her family knew that Twilight was special and had a gift for magic. After takeing her to Princess Celestia's School for Gifted Unicorns her entrance exam was for her to use magic to hatch Spike's egg. And she passed. Princess Celestia's seen this and adopted her as her student personally teaching her magic. Soon after Celestia took her under her wing she sent her and Spike the dragon she hatched from the egg to Ponyville to check the town's preparations for the Summer Sun Celebration. Once there she meets Rarity, Pinkie Pie, Rainbow Dash, Fluttershy, & Applejack she has no idea that these five ponies will not only be her best friends but they will also help her with so many things as time goes on. Soon after the Summer Sun Celebration Celestia desides to have Twilight move to Ponyville and stay so she can learn about Friendship. She reopens the Golden Oak Library and lived there until it was destroyed and Friendship Rainbow Kingdom castle was created for her and her friends. Over the years in Ponyville she and her friends bumped heads with some powerful villains but with the help of her friends they always win. Personality: Twilight loves to read and learn. She spends a lot of her time at the Castle of the Pony Sisters reading books. However now that she has her own Castle I'd say she has moved the books to her castle and spends most of her time there. She's a very down to earth pony and has to make sense of everything no matter what it is. She is very organized and like to make check lists then make check lists to check her check lists and so on. She loves to help spread learning to others and likes to help teach foals about things they need to learn. And exceptionally talented at magic but then again when your cutie mark is magic why would you not be? Job: She is the Princess of Friendship and Ruler of Friendship Rainbow Kingdom. Her castle is located in ponyville it is really at this point unclear of what she does but I am looking forword to Season 5 to find out! Sample Post: Twilight Sighs softly there was nothing to do today. She had thought that having a job as a Princess would give her more to do but it seemed that was not the case. Her friends where off doing there chores for the day. Pinkie Pie was working at Sugarcube, Rarity was at Carousel Boutique making dresses with Spike helping her, Fluttershy was at her cottage taking care of the animals, Applejack was bucking apples at Sweet Apple Acres, & Rainbow Dash was off on weather patrol but had Wonder Bolt Training later that day to. Everypony was busy every pony but Twilight she sighs again " Well I thought that having a Kingdom was going to be more exciting then this " she grumbles to herself as she stand " Well that's ok it gives me lots of time to read I wonder if Sunset Shimmer has wrote to me at all lately? " she trots off to her room to get the book off the table beside her bed.